All gastronomy enthusiasts are well-acquainted with the famous Michelin stars. For those foodies who are late at the party, the Michelin stars are the Oscars of the culinary industry. They are the rating system of the prestigious Michelin Red Guide that reflects the quality of a restaurant. An establishment can be awarded up to three stars, each of them having a different meaning: one star – “a very good restaurant”, two stars – “excellent cooking that is worth a detour”, three stars – “exceptional cuisine that is worth a special journey”. Earning a Michelin star is very difficult and can change the fate of a restaurant. 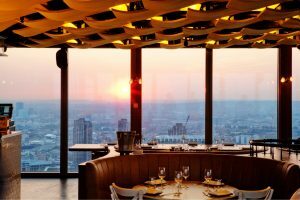 London is a city famous worldwide for its exquisite restaurants and it’s got enough stars to maintain that reputation, more precisely 70 shining Michelin stars: 58 restaurants with one star, 9 with two stars and 3 with three stars awarded. Alain Ducasse at The Dorchester – one of the three Michelin stars restaurants in London proves that eating in a hotel can be just as exciting as eating at a fancy independent restaurant. Alain Ducasse’s restaurant is the very definition of elegance and style. 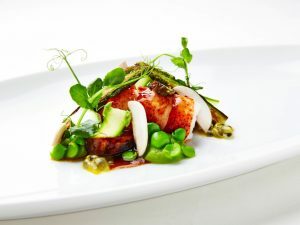 If you want to feel the taste of French haute-cuisine, there’s no better option than The Dorchester where you can try some of the Chef’s signature dishes such as Dorset crab or halibut with oyster and seaweed. Besides the food, the wine selection is also outstanding. The Araki – Another 3 Michelin starred restaurant, Araki offers a completely different approach on fine dining. Only nine guests can sit at the table, while Chef Mitsuhiro Araki works his magic at preparing the exclusive Omakase menu, making the restaurant one of London’s hardest to get into. The food is amazing, but the whole experience is indescribable. Dinner by Heston Blumenthal – Chef Heston Blumenthal offers a refreshingly modern take on traditional recipes, creating some of the most inventive dishes you’ve ever tried. British culinary history serves as the inspiration for all of his quirky creations. The experience of dining at Dinner is about the element of surprise. It’s hard to guess what you’re going to get when you order a “meat fruit”. Spoiler: it’s not a fruit, but you won’t regret it! Ametsa with Arzak Instruction – This fine Spanish restaurant from the Arzak family brings a contemporary interpretation of the New Basque cuisine. The combination of typical Spanish flavours with local ingredients and modern cooking techniques results in some intriguing delicious dishes such as grouse with dry apricot mousse and golden berries or suckling pig on a bed of carob crumbs. Hakkasan Mayfair – Set over two floors, this Michelin starred restaurant offers some amazing dishes from the Cantonese cuisine. Chef Tong Chee Hwee keeps things interesting by always transforming the dishes, offering a modern vibe to traditional Chinese food. Tip: try the dim sum! With so many great restaurants in London, the only way you can satisfy your curiosity and appetite is by going on a culinary pilgrimage. This entry was posted in Dinning, London, New. Bookmark the permalink.